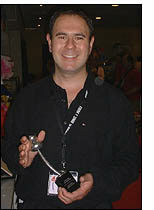 Nicholas Einhorn, seen here with his award for equal 2nd place in Micro Magic at FISM 2003, was just one of a number of successful British competitors at this year's congress in the Netherlands. The Great Nardini, representing Scotland, was awarded the Comedy Award and Etienne Pradier (on Secrets of Magic tonight), representing the UK, was placed equal third in the Card category. 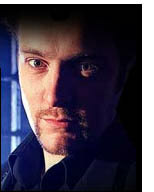 The Magic Circle were proud that four of its members triumphed in the competition with member Norbert Ferré (France) not only winning first prize for manipulation but also the Grand Prix for Stage Magic. President Michael Bailey said: "We can be proud of all our members who competed and did so well. To them, and the others who appeared during the FISM Congress, I send my heartiest congratulations." FISM takes place every three years - the next one in 2006 will be held in Stockholm. Visit: www.fism.com. Here are the competition results. 150 magic acts were judged by a panel of 12 international judges.